Pin Dancers Costume - The Big Lebowski. 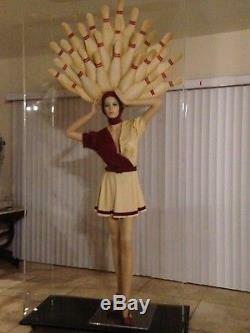 This complete dancers costume was worn during the Gutterballs dream sequence in the Coen Brothers cult film The Big Lebowski. 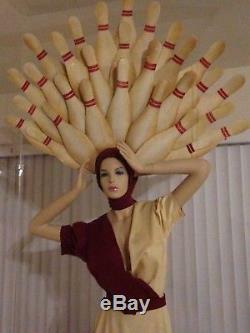 The most impressive part of the custom made costume is the bowling pin headdress. This item was meticulously constructed out of hand painted and cut foam layers. 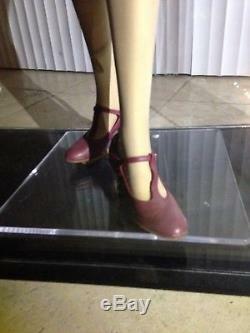 The rest of the costume consists of a 2-tone cotton/poly burgundy and yellow short sleeve blouse, matching skirt with a burgundy stripe at the hem and a pair of t-strap dance shoes. The costume was created for use in the film by J & M Costumers of Hollywood. 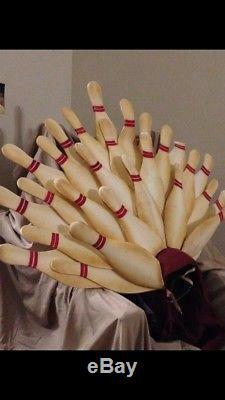 The iconic Gutterballs dancer costumes were seen in the dream sequence where The Dude (Bridges) has a hilarious bowling themed fantasy featuring various characters from the film. The elaborate set designs and use of multiple choreographed dancers in the Gutterballs sequence appear to be the Coen brothers homage to Hollywood legend Busby Berkeley, and was one of the most memorable moments from the film. This original screen used costume was one of a limited number created for the production and is a true signature piece from The Big Lebowski. You are however welcome to pick it up - we live in Los Angeles. 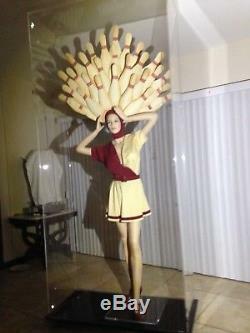 Please note that the mannequin and Perspex case are not included. Please check out our other items also. 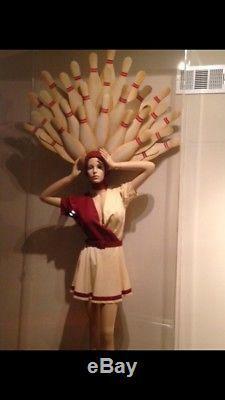 The item "The Big Lebowski Gutterballs Dream Sequence Pin Dancers Costume Screen Used" is in sale since Tuesday, December 26, 2017. This item is in the category "Entertainment Memorabilia\Movie Memorabilia\Props\Originals". The seller is "bush5555" and is located in Beverly Hills, California. This item can be shipped to United States.